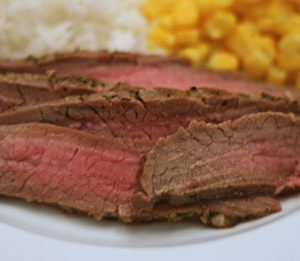 Until a few years ago, I had never even heard of flank steak. Chuck, cube, sirloin, strip, porterhouse, filet, T-bone . . . those were all fine and recognizable. But flank steak? No clue whatsoever. And it’s certainly not the sexiest of names so I didn’ t have high hopes. Finally, after reading about it again and again and again, I gave in and tried it. As it turned out, when cooked just right, this lean meat is quite tasty. I’ve since marinated and stuffed my way through many flank steaks. Earlier this week I pulled a flank steak from our freezer, intent on making my Guiltless Beef with Broccoli. As fate (and a bit of sickness-fueled disorganization) would have it, we’d already eaten the broccoli so that idea was nixed. Instead, I went with a nuanced rub that gave a burst of zing and a hint of sweetness. Just a tiny hint. It was tender, juicy and packed with flavor. Ooh, just so good. The kids devoured it. Shawn loved it and commented on how close it is to a skewered beef dish that he likes at a local restaurant. And me? Well, we will be having this again very soon. Loved. It. Stir together the olive oil, salt, pepper, garlic, chipotle and honey in a bowl. 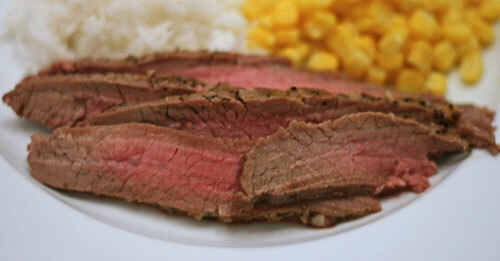 Lay the flank steak out on a large plate and rub half of the mixture into one side of the meat. Flip and rub the remainder into the other side. Place the plate in the fridge and let sit for at least three hours. Remove the steak from the fridge and place on a broiler pan. Boil on high heat in the oven for 8-12 minutes per side, flipping once, to desired doneness. I aim for well done on the ends and medium in the middle so 10 minutes on the first side and 9 minutes on the second does that for me. Let sit for about 10 minutes before carving against the grain into thin slices. LEFTOVERS: Leftovers from this are a total hit. You can chop up the beef and serve atop a salad. Or slide the meat and make fajitas or burrittos. Diced meat can dress up quasadillas or even homemade nachos. Previous Post: « Wordless Wednesday: Ball! We eat flank steak quite often. I have my recipe favorites but I’m always happen to have another! Sounds wonderful! This sounds soooo good! I actually went to the market this morning to get the ingrediants. Im going to make this tonite….I will let you know how it turns out!